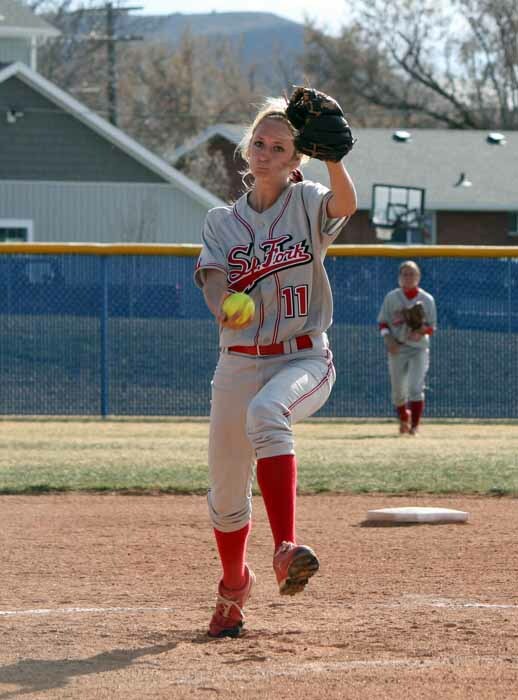 SALEM – A year ago, Southern Utah County softball rivals Spanish Fork and Salem Hills met three times, as the Lady Dons made the move from Class 3A to 4A’s Region 8. After the teams split their league contests, their final get-together came in the state tournament elimination bracket finale, where an eight-inning affair went the way of the Skyhawks. Salem Hills had just three hits in that contest, but managed a 4-3 win that sent it on its way to a two-game sweep of Bonneville later that night and a second consecutive state title. With pitcher Kirtlyn Bohling graduated and head coach Renae Kinghorn now living in Georgia, the 2015 season features a new look Skyhawks team under the direction of Jess Sipherd. Tuesday, Salem Hills opened Region 8 play on its home field after beginning the season 1-5 against a difficult non-region schedule. The league opener, however, was a continuation of that rough slate of games, as it came against a 4-2 Spanish Fork team. Pitching and defense was the story of the day, and the game eventually tilted towards the team that made one more defensive play, got slightly better pitching and had that one big hit. The Lady Dons led 3-0 heading into the home half of the sixth and survive a mini-rally to hold off Salem Hills 3-2. The only thing keeping Spanish Fork pitcher Cambrie Hazel from entering the bottom of the sixth with a perfect game was a couple of first-inning errors. 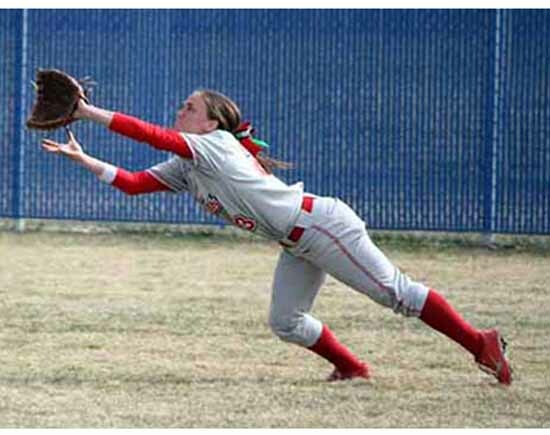 She set down 15 consecutive hitters from the time those two miscues put two on with one out in the opening stanza on into the sixth inning, results that were helped considerably by a pair of diving grabs by centerfielder Dani Perkins. While Hazel was rolling in the circle, the Lady Dons were generating just enough offense to build an advantage on the scoreboard, and the pitcher played a role there as well. Spanish Fork scored its first run in the top half of the second, and it came after two were out. Catcher Whitney Perkins reached on a walk, went to second on a wild pitch, then moved to third on a bunt single by Perkins. That set the table for Hazel, who bounced one in the hole between the third baseman and shortstop, reaching on an infield single that chased Perkins home with the run. Kaylee Bott tripled to right field with two out in the third, but Spanish Fork was not able to get her home, and then the Lady Dons loaded the bases on three walks by the Skyhawks’ freshman pitcher Destiny Decock in the fourth, but a diving catch by Alex Oveson in left early in the inning and a huge inning-ending strikeout by Decock got Salem Hills out of that stanza unscathed. Oveson took over in the circle after another walk in the fifth and retired the first three batters she faced, but a two-out walk in the Spanish Fork sixth set the table for Lady Don outfielder Payton Sorensen. She followed the walk with a line drive over the left field wall, a two-run home run that extended the lead to 3-0, just enough to survive the Salem Hills half of the sixth. Catcher Shina Parrish got her team’s first hit of the contest in the Skyhawk sixth, with a long single off the left-field wall. She moved to second on a passed ball and scored on Spanish Fork’s third error of the day, as Abbie Tuttle reached and advanced to second on a throwing error. When Oveson’s single to left field turned into more as the ball kicked off the glove of the outfielder, Tuttle came around to score the second run of the inning. With Salem Hills in position to tie the game or even take the lead, with runners on first and second and just one out, a base-running mistake allowed the Lady Dons to escape the sixth without further damage. 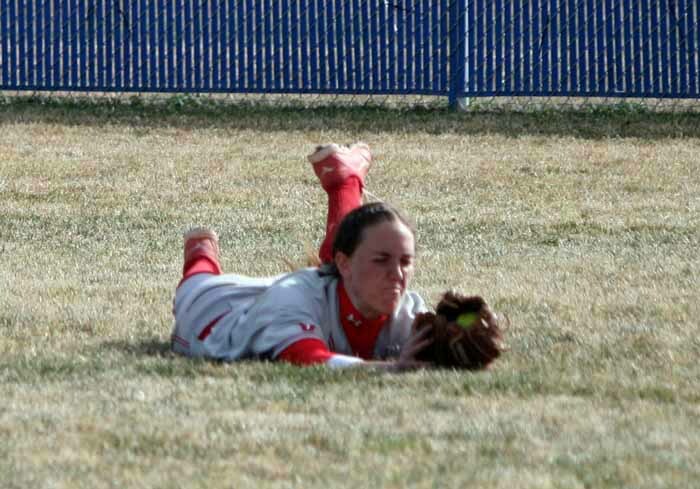 Shortstop Cheyenne Pratt fielded a ground ball and tagged the lead runner for the second out before delivering the throw to second base in hopes of completing a double play. A safe call at second was apparently not noticed by the Skyhawk base runner, who walked off the base only to be tagged out for the final out of the inning, and after Hazel set Salem Hills down in order in the seventh, that was enough to preserve the win for Spanish Fork. It doesn’t get any easier for the Skyhawks (0-1 in Region 8, 1-6 overall), as they visit a talented Springville team (1-0, 8-2) Thursday for a crucial region battle before stepping outside of league play Friday with a visit to defending 5A state champion Lehi (4-3). The Lady Dons (1-0, 5-2) have a bye in the region schedule Thursday, so they will instead visit 5A powerhouse Copper Hills (3-6) that day before visiting Payson (5-3) for another non-league game Friday.